I was recently a corporate motivational speaker for a software franchise event. This lively and engaged crowd loved to laugh and interact. They are also very competitive and love to take risks. Most of all, they loved to have fun at work! The meeting planner knew her audience well, so she went for the ideal event add-on - an escape room. Known as a physical adventure game where players solve a series of puzzles using clues, hints, and strategies to complete the objectives. A time frame was given, and secret plots and clues were hidden in each of the rooms. It was a genuinely interactive opportunity to solve problems, work together and bond. The escape room also offers a venue for some effective competition. Once the room door was closed, the group is tasked to work together and time to escape. 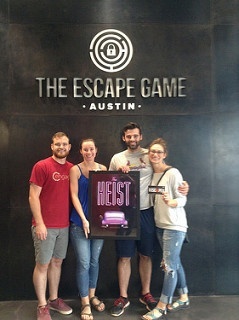 The meeting planner tailored the theme of the escape room to match the idea of the event, "Teamwork". A theme room may not be for every event. Imagine being locked inside a themed adventure room with your colleagues. Some people would do anything to escape the experience altogether. However, this audience of young, entrepreneurial software franchise owners loved every bit of it. The victors bragged for days about who won and who lost. Although I didn't attend the escape room part of the event, I did hear a lot about it, and I was able to have a lot of fun interacting with the audience about what they learned and how they felt about it. The feedback was they loved the experience. Several funny, competitive interactions will be remembered for years to come. The franchisees were a very extroverted group. Extroverts I find need to feel included in a presentation. Thus it has to be interactive. One of the puzzles was too hard, so they had to ask the facilitator for several hints. It's true that we laugh more at our challenges or failures than our successes. Thus, this was an entertaining way to laugh at stress together as a group and was a high learning point. Escape rooms are expensive. This franchise owners event brought the whole group offsite( in a bus) to a facility. Also, most escape rooms only accommodate 8-12 people, so several groups can go at a time but just if they have several rooms. This escape room was a real success- like solving a puzzle, it's addicting.